Set includes Official Illustration Book Vol. 2 & file folders with original illustrations! 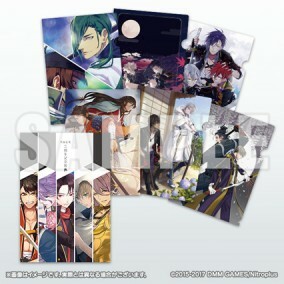 And at the Nitroplus Online Store the book is bundled together with the "Summer 2017 Touken Ranbu-ONLINE- Original Illustration 6-Piece File-Folder Set!" * Comic Market 92 purchase bonus "Original Illustration Postcards - 6-Piece Set" is not included. ・There are currently no plans to offer the "Touken Ranbu 2nd Year Anniversary Commemorative Album" by itself at the Nitroplus Online Store. Scheduled to ship from (Thu) Aug. 31, 2017.In the event circumstances delay shipment, we ask for your patience and understanding. Frist available at Comic Market 92.